December 31, 2011 By Terri Knox in About Us, Historic Jordan, Innkeeper Travelogue Comments Off on Cheers to Life in 2011! Cheers to Life in 2011! Our family’s favorite toast: Cheers to Life! Inspired by a friend who takes a photo of her feet standing at a special place or event, we began to commemorate some special places and events with a toast. So here’s to 2011 ~ here’s to life! Thank you to all our guests for making 2011 our best year yet at the Nicolin Mansion. And wishing you the all the best in the year to come! Our guests tend to dine at restaurants in Jordan for their evening meals. And though some venture anywhere from Excelsior to downtown Minneapolis or St. Paul, the majority dining outside of Jordan do so within 10 miles in the surrounding communities of Shakopee, Chaska, Belle Plaine, New Prague, and Prior Lake. So Kevin and I thought we would visit and review some of those restaurants in the surrounding communities. We begin in Prior Lake, at Perron’s Sul Lago. This is a fine dining restaurant near a pond between Lower and Upper Prior Lake. The atmosphere is stylish and inviting. The seating is warm and inviting, available at the bar, and at a variety of tables in cozy sections. We start our Perron’s experience with an appetizer. Among the choices of Brushetta, Calamari, Prosciutto and Fresh Mozzarella, Baked Polenta, and Mussels, we choose: Stuffed Mushrooms ~ mushrooms stuffed with sweet sausage, fresh herbs, roasted garlic, and smoked provolone. Delicious! The entrees on the menu include steak, duck, chicken, risottos, pastas and gnocchi. I’m partial to gnocchi, so I chose the Scallops Gnocchi ~ seared sea scallops, smoked bacon, onion, sweet peas and cream. Melt in your mouth deliciousness! I also chose the Sauteed Baby Spinach with Prosciutto as a side vegetable. Loved it! Kevin’s absolute favorite is salmon, so he chose the special of the day featuring salmon over gnocchi. Perfectly presented and prepared. We had a fantastic experience at Perron’s Sul Lago. So after you’ve already visited everything Jordan has to offer during your stay at the Nicolin Mansion, venture 12 miles east to experience Italian dining on the lake. Suzette’s is likely the most popular dining destination for our Nicolin Mansion guests. And it’s likely the most unexpected in our quaint town. The restaurant in located in a very unassuming building, an old Bridgemann’s, along Highway 169 about a mile out of town. We’ve heard people drive up and think they are not at the right place – so we usually tell our guests beforehand to go, sit down, and order – you will be amazed. We refer a lot of guests, but we usually dine at Suzette only about once or twice a year. The funny thing is, every time we are seated (with maybe one exception) we get the same table! Do they know we’re coming and save it for us? Who get’s it the other 363 days? Anyway, I digress. But while Kati’s off getting our soup, we actually look at the menu and realize we haven’t ordered an appetizer. Bummer! So, she holds our soup so we can have our Portabella with Chicken Mousse and Brandy appetizer first. Our enthusiasm continued through the appetizer, as I forgot to take the picture before we ate three-quarters of it! Sorry. Just imagine a full portabella cap. Other appetizer choices we had (and have had in the past) are Escargot with garlic butter and onion, and Crab Cakes with dill cream sauce. We finish our appetizer, and now Kati can actually bring us our soup. We both ordered the Shrimp Bisque. Lovely! Kevin ordered extra rolls, which were warm and crusty, and awesome dipped in the soup. The other soup of the day was Cream of Broccoli (I know, we should have ordered one of each to report, but neither of us were willing to give up Shrimp Bisque). And now for the main event – the specials of the day. I ordered the Ribeye – my family are not huge red meat eaters (and I even abstained for years until I was pregnant with my second son), so whenever I go out for dinner I tend towards the beef specialty. And I was not disappointed. It was enormous, and I got to enjoy it for lunch the next day in my cubicle, and even more unexpected setting for fine French cuisine. Other beef choices on the menu are Steak Cafe de Paris (Grilled New York Strip topped with garlic butter) and Chateaubriand (beef tenderloin topped with bordelaise sauce). Suzette’s also offers pork options of Pork Suzette (twin medallion of pork tenderloin topped with shrimp and swiss cheese) and Cranberry Pork (sliced pork tenderloin topped with fresh cranberry sauce). I’ve had Pork Suzette and can highly recommend it. Suzette’s chicken options include Chicken Fettuccine, Chicken Marsala, and Chicken Wellington (chicken breast stuffed with a blend of mushrooms, wrapped in a pastry shell). These are also representative of some of the Italian offerings of that Fine European Cuisine. I’ve never tried the Lamb, a New Zealand Rack of Lamb, but I think that will have to be my next choice (in October for our anniversary). Kevin’s entrée choice was the Stuffed Salmon special – no surprise if you know Kevin, salmon is his all time favorite. And he loved this, stuffed with crab and scallops (Awesome! I tried some off his plate). The Seafood selection is the largest on Suzette’s menu: Seafood Manicotti, Crab Cake Meal, Salmon Dill Beurre Blanc (salmon broiled and topped with dill white wine cream sauce), Marin Grivois (shrimp, scallops, chopped onions, garlic and linguini – I overheard Kati tell another table this was her favorite – Kevin will have to get that in October), Petite Fillet with Shrimp (beef tenderloin with large broiled shrimp), Shrimp Provencal (gulf shrimp sautéed with olive oil, onion and garlic), Sea Bass, Seafood Mix Grill (gulf shrimp, scallop, and petite lobster tail), and Suzette Mixed Grilled (petite lobster, beef tenderloin, and pork tenderloin – I’ve heard a common favorite of our guests). And there is a Vegetarian choice of assorted vegetables served with mushroom cream sauce and your choice of pasta, rice or pastry shell. We are feeling completely satisfied, and Kati comes out with this Fruit Napoleon compliments of Chef Ban! Beautiful! For a split instance we thought of boxing it up and bringing it home to the kids, but quickly decided to have Ban cut it in half and share with another table, our Chamberlin Room guests sitting across the room from us! It was perfect. Another dessert favorite of ours is the Creme Brule. Chef Ban (formally Banrith Yong) joined us at the table for a moment, as he usually does, to chat a few minutes about all our ideas of bringing this beautiful small-town’s offering to yet another level. He also likes to joke about bringing Kevin back to Cambodia and starting a band – we’ll make lots of money he says. Speaking of the kids – they do have a kid’s menu: Spaghetti and Meatballs, Chicken Fettuccine, and Pizza ($4.95 each). Our boys keep asking us to take them to Suzette’s and we keep disappointing them by only going there on our date nights. I guess it’s time for the Mama to take the Boys out for our own date night at Suzette’s. As promised, we did finally take our boys to Suzette! And it lived up to all their impressive expectations. We’ve entitled it a night to celebrate, and indulge, in all the best Suzette’s has to offer. Starting with the appetizer: Escargot with garlic butter & onion. Noah’s choice is Marin Grivois ~ Shrimp, scallops, chopped onions, garlic and linguini sauteed with herbs and spices. I’ve been promising to try the duck, and I’m in luck with tonight’s duck special! Too perfect! Kevin loves the fish at Suzette, and is satisfied once again with tonight’s fresh fish special. And since we are indulging, and it’s our boys’ first Suzette experience, we can’t turn Jesse down for his choice of the Seafood Mix Grill ~ Gulf shrimp, scallop and petite lobster tail, served with garlic whipped potatoes and vegetables. We are blessed once again with a dessert gift from Bahn ~ this night a beautiful cheesecake. Thank you Bahn!! Satisfied, our boys have finally had the Suzette experience. Cheers to Life Suzette’s!! Carasim Coffee Shop is far more than just Coffee. While it’s true they do serve coffee, espresso, chai, fine teas, Italian sodas and real fruit smoothies, there is a lot more going on in Frank Nicolin’s former Opera House. Dining at the vintage bar or booths not only includes a great nostalgic atmosphere, there is also great home cooking. From simple breakfast items, to soup, salad and sandwiches, the menu changes to include freshly made daily specials. They were serving a Roasted Red Pepper Tomato soup the day I took these photos. One of our favorites is the pizza. It’s become a tradition whenever we have family staying with us from out of town. The crust is thin, the way I like it, made to order. And at $9.95 for a large, two-topping pizza, it’s a great value as well. But the ice cream counter and the Themed Elegance chocolate shots are the hands down favorite for the Knox boys! Like I said, there’s more than just coffee, and dining. Carasim is located right next door to the Nicolin Mansion, and through the Mertz era, the two properties were jointly owned. The historic building, built in 1876, has housed Nicolin’s Opera House, Mammoth Store, and a favorite the locals still talk about, Geno’s Tap. A walk through to just admire the interior is well worth a stop. Besides the classic wooden bar and booths, there’s a beautiful hand painted mural of historic downtown Jordan. It’s doesn’t stop there. The shop is stocked full of antiques for sale. From antique depression glass to furniture, it’s my first stop whenever I’m looking for something to add to the bed and breakfast. And I’ve bought several items. They also sell great historic photos of Jordan, including one of the U.S. 4th Calvary en route to Fort Snelling in front of both Carasim and the Nicolin Mansion in 1908. Carasim also hosts a thrift shop with great clothing buys supporting Broken Pottery Outreach, as well as the Geneva’s Daughter Ocassional Sale. The upper room where the Opera stage still stands, is host to a variety of special events. And the back room hosts entertainment events, such as junk swap, Thrift Shop fashion show, and live music. 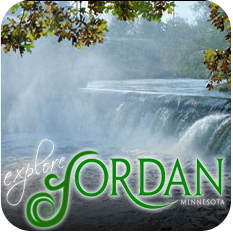 Watch the Jordan Events Calendar for upcoming events. The building was known as the HUB in it’s day, and with all that’s still going on, the name is appropriate. Psycho Suzi’s Motor Lounge was our second pick for Diners, Drive-ins and Dives where Guy Fieri went in Minneapolis. An updated tiki bar for the new millennium…we were hoping it would be as interesting as their website made it sound. And we were not disappointed. From the promised giant tiki to the rules and regulations in the menu, it was an experience. The riverfront patio looks fabulous – it was too cold to lounge and sip a drink by the Mississippi, but since I was going to quit smoking that night I enjoyed my next to last cigarette(s) under the patio heaters dreaming of returning on a hot summer night. But the food is the thing that brought Guy to this dive. So we started with appetizers, or “Pu-Pu for you” according to Suzi, that are promised to be calorie free “made one at a time by the hands of fair Minnesota maidens… who sing tiki songs and repair cars and of course, cook.” We chose the Triple Garlic Hummus Plate and Fried Asparagus. Beer battered and deep fried…so it’s really healthy. The menu also promised World Famous Minneapolis Pizzas (who knew?). Our choice was the Ultra Bird – Roast chicken, onion, fresh tomato, feta, and mozzarella cheese over white-wine sauce. Awesome! According to Suzi "Psycho Suzi’s is world-renowned for its tasty pizza. We’ve won thousands of awards for its deliciousness. So many we had to build a trophy room in Ramsey County." Great food, unique atmosphere… Highly recommended! We’ll be be back, in the summer, on the patio. Guy actually visited The Nook in St. Paul on Diners, Drive ins and Dives, but it was closed since a fire on December 14th. Ted Casper & Mike Runyon started with The Nook, ” the small place with the big burgers” and later opened a second location, Shamrocks, a larger place with the same great food. So we decided Shamrocks would (almost) count as going where Guy went. Shamrocks has a great atmosphere. A great bar with great beer while you wait for a table. At the end of the bar is “The Lobster Zone” – one of those claw games but the prize is a lobster – if you catch it, they cook it. We didn’t. Live music is featured on weekends, and while we were waiting to be seated, the Mouldy Figs were setting up for a great night of jazz. The Nook is known for their legendary, famous for generations, Juicy Nookie Burger – a stuffed cheeseburger – also served at Shamrocks. We had to try both the traditional Juicy Nookie, stuffed with cheddar, and the Paul Molitor, stuffed with pepper cheese. Served with their hand-cut fries. Shamrocks has a great laid-back atmosphere, great music, and incredible food. It felt like we were on vacation, if only for a night. One of our favorite shows is Guy Fieri’s Diners, Drive-ins and Dives on Food Network. So on our trip to Nashville, we decided to start going where Guy went. Our inaugural diner was Arnold’s Country Kitchen. It also was our first meat-and-three experience. If you’re a northerner like us, this common southern style of restaurant was something uncommon. Meat-and-three simply refers to the meals served for one price – a choice of meat plus three vegetables. But at Arnold’s you have a choice of meat-and-none and meat-and-two as well. Plus bread, actually corn bread. I ended up with the meat-and-two. I wanted somthing distinctively southern, so asked the server for his recommendations. The meat special of the day was a roast beef with gravy, and for vegetables he recommended the fried green tomatoes and mustard greens. Awesome! And the corn bread came as both muffins and pancakes. Incredible food. We got through the line right away, but by the time we left there were no tables or chairs available, and a line out the front door. We need a meat-and-three in Minnesota!